Please read the following safety information before using your camera. Attention to these warnings will help prevent personal injuries and damage to the product. This camera should be used in a responsible manner for its intended purpose. Humaneyes Technologies shall not assume responsibility for damages caused by disregarding these safety guidelines. The basic safety instructions and the product documentation should be kept in a safe place and passed on to subsequent users. Indicates a hazardous situation which, if not avoided, may result in death or injury. Indicates the possibility of incorrect operation which can result in damage to the product. 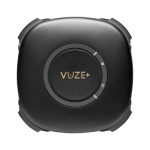 The Vuze Camera should be stored at an ambient temperature between -20 to 60 °C (-5 to 140 °F) and relative humidity under 95%. The camera should be kept out of the reach of children, infants and pets. A strap or cord wound around a child’s neck may result in asphyxiation. Care should be taken of possible loose or broken parts that could cause injury. 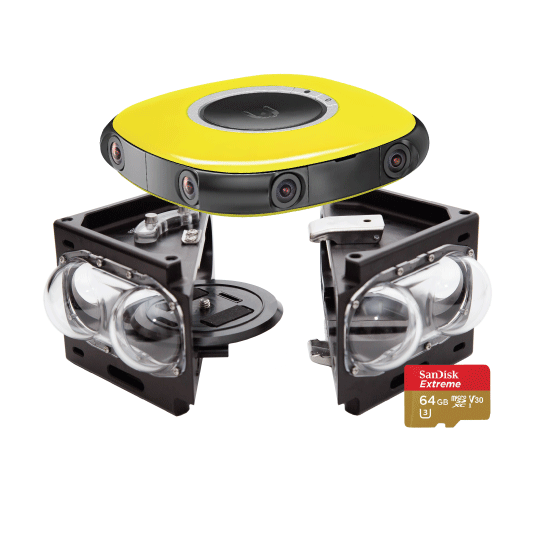 If internal components become exposed as a result of damage to the camera do not touch them and contact customer support immediately. In a humid environment or exposed to dust. Before cleaning the camera disconnect it completely from the power supply and make sure the interface panel cover is closed. Use a soft, non-linting cloth to clean the product. Never use chemical cleaning agents such as alcohol, acetone or diluents for cellulose lacquers. This camera does not contain any user replaceable or serviceable parts. Do not take apart or attempt to service the camera yourself. The internal battery is not user replicable. Never remove the cover or any part of the housing of the camera. In the event of an equipment malfunction, all repairs must be performed either by Humaneyes Technologies or by an authorized agent. For service information contact Humaneyes Technologies customer support at vuze.camera/contact/. Be careful not to subject the camera to high impact. If the camera was subject to a fall or other high impact, check the camera carefully for any damage. If any damage is visible the use of the camera must be stopped immediately. This product contains an internal non-replaceable Li-ion polymer battery. 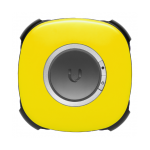 We recommend you charge Vuze Camera in an ambient temperature from 0 to 30°C (30 to 85 °F) while the camera is off. 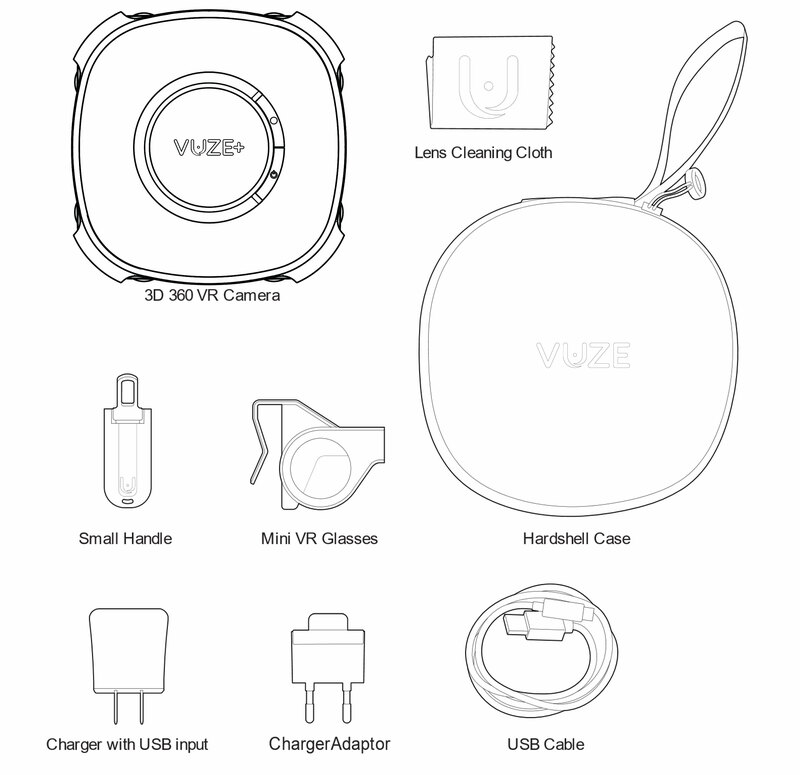 We recommend to use Vuze camera charger and under the operating conditions for optimal charging time. The following information on electrical safety must be observed, failing to follow these instructions may lead to electric shock, fire and/or serious personal injury or death. Never use the charger if the power cable is damaged. Check the power cable on a regular basis to ensure that it is in proper operating condition. Before charging the camera and plugging the charger into the main power supply, always ensure that the nominal voltage setting on the charger matches the nominal voltage of the AC supply network. Do not insert the charger plug into electrical outlets that are dusty or dirty. Insert the plug firmly and all the way into the outlet. Otherwise, sparks that result may lead to fire and/or injuries. Do not insert any metallic or wet objects into the camera interfaces. Only the intended cable and memory cards should be inserted in the camera interfaces. Do not overload any outlets, extension cords or connector strips; doing so can cause a fire or electric shocks. Do not insert or remove the plug with wet hands. Never remove the cover or any part of the housing of the charger, doing so will expose circuits and components and can lead to electric shock, injuries, fire or damage to the product. The camera operating ambient temperature is 0 to 40 °C (30 to 100 °F) and relative humidity under 95%. The camera may be operated only under the operating conditions as specified by Humaneyes Technologies. The camera should not be operated in extreme conditions. The camera should not be used near dangerous or flammable gasses or in any location where instructed not to use cameras or connective devices. When the camera is used for an extended period and/or at high ambient temperature and/or exposed to direct sunlight it is normal for the camera body to feel warm. Take care when placing the camera on elevated surfaces and avoid placing it on unstable surfaces. Stop using the camera immediately if it emits smoke or a strange smell, or otherwise behaves abnormally. Avoid overheating the camera. 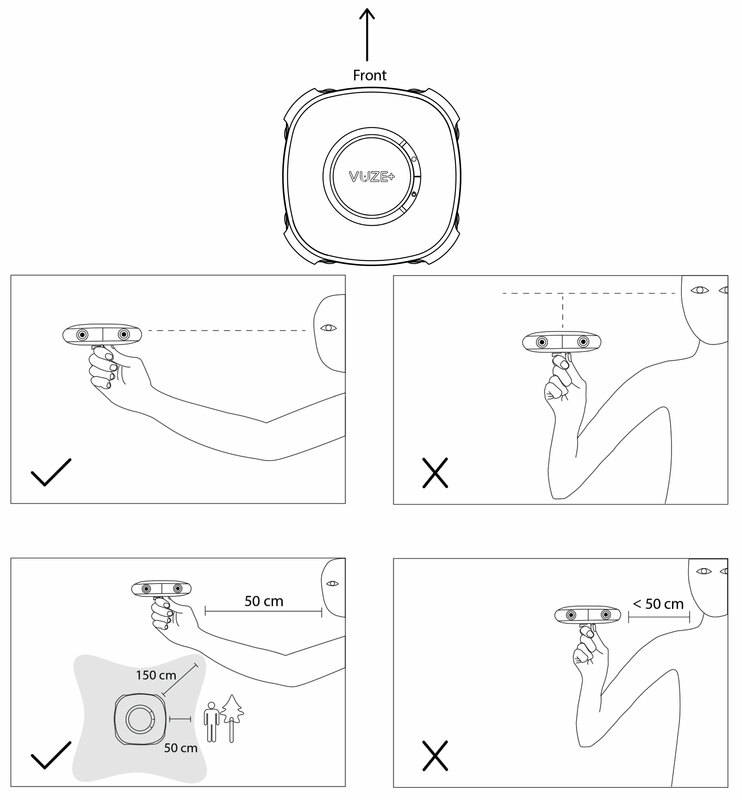 Do not cover or obstruct the airflow around the camera while operating. Use the camera in ambient temperatures as advised in the specifications only. Do not place the camera on heat-generating surfaces, or near heat emitting devices or direct flame. Verify that there is sufficient clearance between the product and any other warm air exhaust. Disregarding these guidelines could lead to overheating, possibly resulting in burns or damage to your camera. The camera adheres to the IP64 protection standard and as such is dust tight and splash proof. This splash protection does not hold if the interface panel cover is open. If the interface panel cover is open, take extra care to avoid damp environments or possible liquid penetration and keep clear of dust or other elements that could penetrate your camera. Even when the cover is closed, it is recommended to avoid using the camera in extremely wet environments. If the necessary precautions are not taken you may suffer electric shock or the camera itself may be damaged, which can also lead to personal injury. The camera’s Interface Panel, hidden behind the cover, has various interfaces and indicators. These interfaces are intended for connection to various external devices. Open the cover to reveal the interface panel. Fold the handle to the open position. Screw the small handle to the tripod socket. 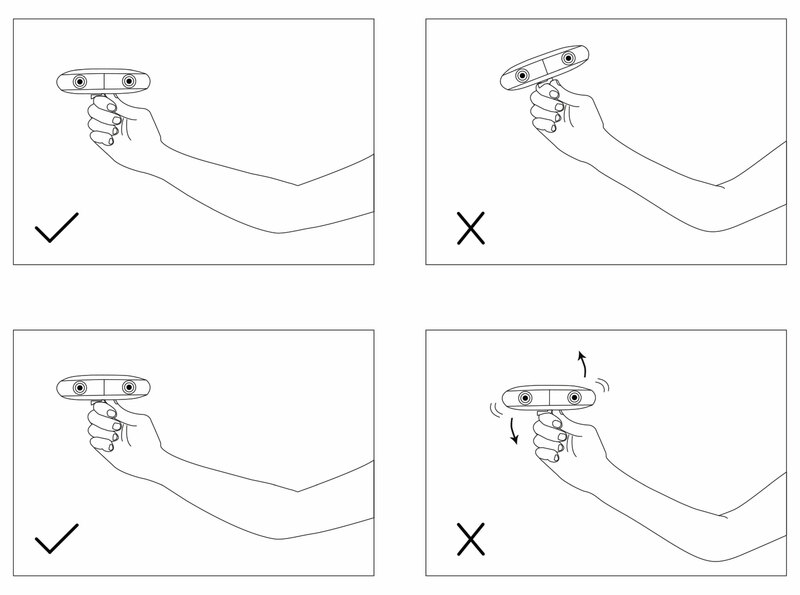 place the metal finger-support opposite to the interface panel. Tighten the black nut for best stability. For storage and when not in use, fold the handle flat against the camera. The camera should be fully charged before each use. Make sure you charge it about 3 hours. The camera has an internal clock. This clock affects the time-stamp on the footage captured. Your time zone will be automatically updated when the Camera is connected to your mobile device through the Vuze Camera App. To ensure the correct time zone connect your camera to the Vuze Camera App as instructed below. On – Press the On/Off button. You will hear 3 beeps and the indication light will blink. Off – Press the On/Off button for 2 seconds. You will hear 3 beeps and the indication light will blink. You can use the camera for recording videos and for taking photos. To change between modes press the On/Off button. Two beeps will confirm the change and the On/Off button will blink twice and change color. When switching between operation modes the camera must be in standby mode. 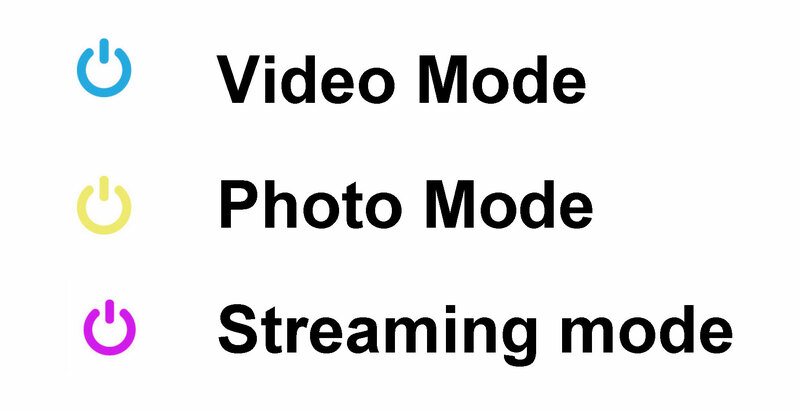 The camera will switch automatically to streaming more when connected to a computer using a USB cable, as long as this option is enabled in the mobile app. Start / Stop Video – Press capture button in video mode. You will hear a single beep when beginning and two beeps when ending a recording. Take a photo – Press capture button in photo mode. You will hear a single beep before and after, and the indication light will blink once. Please make sure that camera lenses are clean before using the camera. Connect the USB cable to the Micro USB camera interface. Connect the other end of the cable to the charger. Plug the charger into an electrical outlet. Charging indication appears. It should take about 3 hours to fully charge your camera. To extend battery life, you can use an external power source while capturing with your camera. Note that you need to hide the power bank under your camera to avoid interfering with the camera’s field of view. Connect USB cable to the Micro USB camera interface. 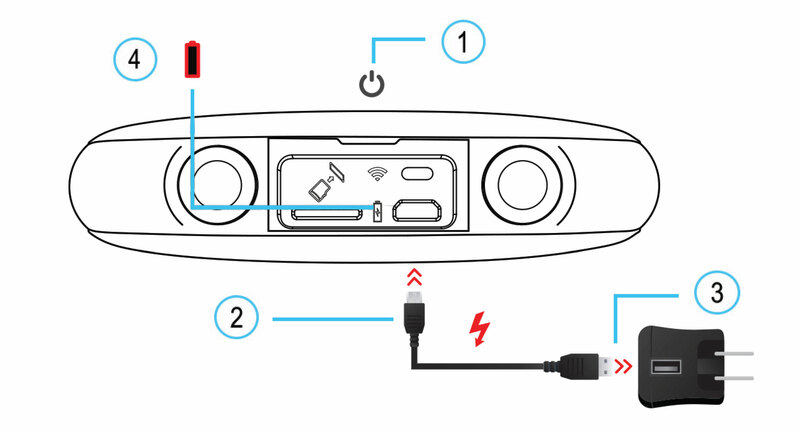 Connect the other end of the cable to the external power bank. Use a special USB connector with a folded neck to avoid interference with the recording. Use high power USB hub for charging while live streaming. 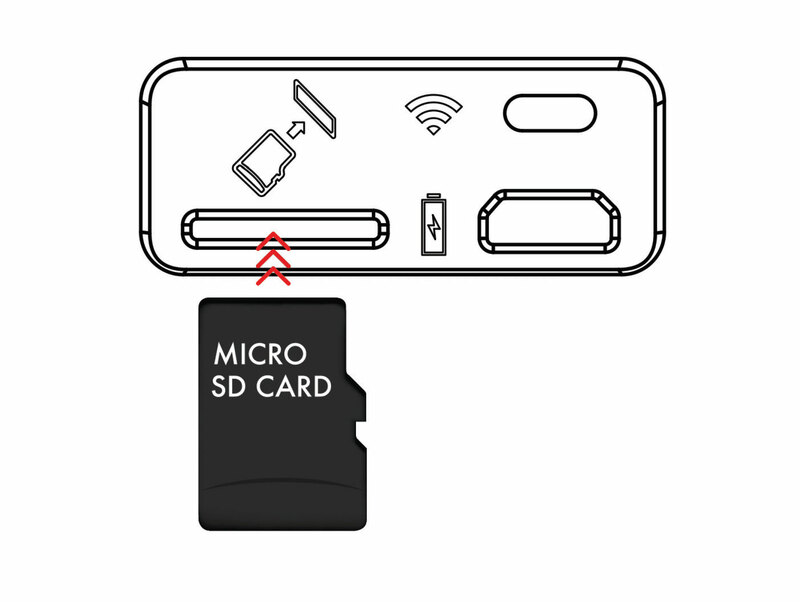 Insert the SD card into the micro SD slot and press it into place. To remove the card, press on it and then remove it. Place a new SD card into the slot and press into place. The camera will support micro SD cards with UHS-I (Ultra High Speed) speed class and above. The camera allows two bit rate settings for recording- 120MB and 80MB (set through the mobile app). When recording at 120MB bit rate we recommend to use UHS-I (U3) – Ultra High Speed Class with U3 Speed Class Mark. When recording 80MB bit rate we recommend to use UHS-I (U1) (Ultra High Speed Class with U1 Speed Class Mark) SD cards. Do not remove the SD card while capturing with your camera or while the camera is connected to a computer. Push the WiFi button. Blue LED starts to blink. Connect your mobile device to the camera’s WiFi. Your camera’s WiFi SSID is its Serial Number, as appears on the bottom of the camera. The default password for your WiFi is 12345678. The WiFi name and password can be changed through the App’s settings after the first connection. Once connected the blue LED will turn on. 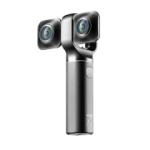 Operate the camera via the Vuze Camera App. 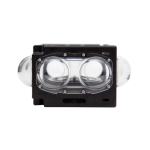 You can also use Humaneyes VR Studio by removing the SD card from your camera and inserting it directly into an SD slot in your computer. Press and hold the On/Off button for 16 seconds when the camera is on. This can be used in a situation where the camera is not responding. To reset the camera’s WiFi to the default password and SSID press and hold the WiFi button for 3 seconds. Copy the vuze_fw.bin file to the SD card root folder. Insert the SD card into the camera’s micro SD slot. The camera will boot normally. The firmware upgrade starts when the orange LED starts to blink. When Firmware upgrade is complete the camera will reboot and go into standby mode. 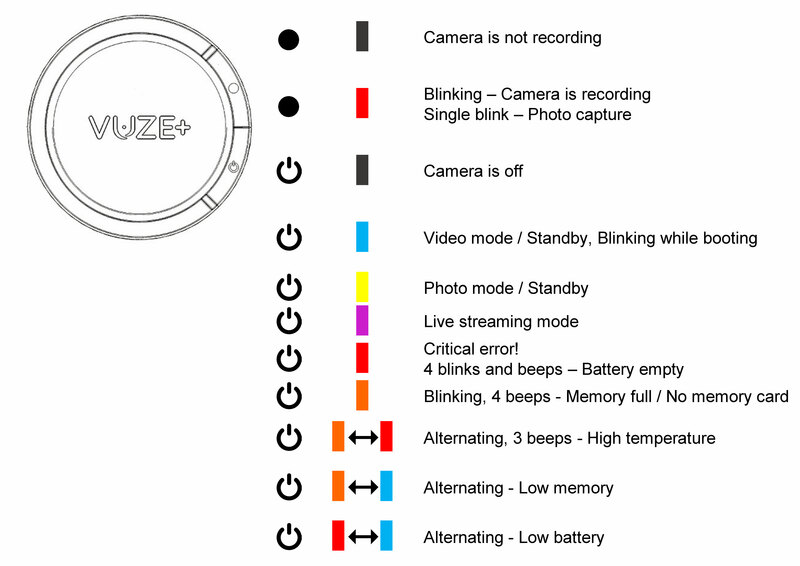 You can check your camera’s firmware version through the Vuze Camera App’s settings. * Please make sure that the camera is fully charged before upgrading firmware. ** During firmware upgrade , do not turn the camera off or push any of the camera buttons. Memory Replaceable Micro SD card, compatible with UHS 1 and above. Who is this Warranty from? This limited consumer warranty (herein the “Warranty”) is granted by Humaneyes Technologies Ltd. (herein the “Company,” “Us,” or “We”). What are the products as defined in this Warranty? The Product/s refers to any new hardware devices purchased from Us, directly or through our authorized distribution channels. Who is this Warranty to? This Warranty is issued to You as an original purchaser (herein “You”) of a new Product from the Company or an authorized retailer. This Warranty cannot be transferred or reassigned to any other user. What does this Warranty do? This Warranty gives You specific legal rights in case there is a problem with the Product. You may have additional rights based on Your location. This Warranty does not affect any rights you have under the laws in your jurisdiction regarding the sale of consumer goods. By using Your Product, You are agreeing to the terms of this Warranty. If You do not agree to these terms, please do not use the Product. What does this Warranty cover? This Warranty covers the Products in the event of defects in materials and workmanship when the Products are used normally and for their intended use in accordance with Company’s published guidelines. The Company’s published guidelines include but are not limited to information contained in technical specifications, user manuals and service communications. How long does this Warranty last? This Warranty lasts for period of ONE (1) YEAR from the date of Your original date of purchase (the “Warranty Period”). Your location may provide You a longer period of protection. What do You have to do prior to requesting Warranty Service? Before Submitting a Warranty claim the first thing You should do if You suspect a problem is contact Us through Our Customer Support Team at https://vuze.camera/contact/ to see if We can help You. How can You claim this Warranty and how will the Company provide the Warranty Service? After a Warranty claim is made, the Company will provide the Warranty Service, subject to applicable law and the Company policy, as follows: Our Customer Support Team will instruct You on how and where to return Your Product. The Company may send You waybills and if applicable, packaging material and instructions on how to properly pack and address the Product, so that You may ship the Product to an authorized service provider location. Instructions may be sent via email or in hard copy with the packaging material. Once the Warranty Service is complete, the authorized service provider will return a repaired or replacement Product, or refund therefor, to You. NOTE: Before returning or replacing any Product or part of a Product for Warranty Service, be sure to back up all data and remove any confidential, proprietary information from the Product’s memory. It is likely that during the repair process the contents of the Product will be completely erased and We are not responsible for damage to or loss of any data, images and/or personal information that may be stored on the Product. How long is the Warranty following repair or replacement of a Product? A replacement part installed by the Company, assumes the remaining term of the Limited Warranty or ninety (90) days from the date of replacement or repair, whichever provides longer coverage. When a part is replaced or a refund provided, any replacement item becomes the Customer’s property and the replaced or refunded item becomes the Company’s property. The Company reserves the right to change the method by which We may provide the Warranty Service. Warranty Service will be limited and subject to, and adjusted per, the options available by law in the country where service is requested. Warranty Service options, parts availability and response times may vary according to country. You may be responsible for shipping and handling charges if the Product cannot be serviced in the country it is in. If You seek Warranty Service in a country that is not the original country of purchase, You will comply with all applicable import and export laws and regulations and be responsible for all custom duties, V.A.T. and other associated taxes and charges. Where international service is available, the Company may repair or replace parts with comparable parts that comply with local standards. What does this Warranty not cover? 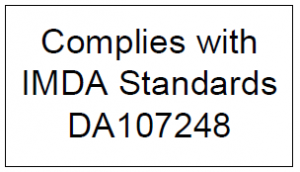 To the extent permitted by applicable law, this Warranty does not apply: (a) to software (including but not limited to online software and mobile apps) and accessories (b) to consumable parts, such as batteries or protective coatings that are designed to diminish over time, unless failure has occurred due to a defect in materials or workmanship; (c) to cosmetic damage, including but not limited to scratches, dents and broken plastic on ports unless failure has occurred due to a defect in materials or workmanship; (d) to damage caused by use with a third party component or product that does not meet the Product’s specifications; (e) to damage caused by accident, abuse, misuse, neglect, improper shipping or installation, fire, earthquake or other external cause; (f) to damage caused by operating the Product through irresponsible or improper use, including not in accordance with the Company’s published guidelines or any non-recommended practices; (g) to damage caused by service (including upgrades and expansions) performed by anyone who is not a representative of the Company or an authorized service provider; (h) to a Product that has been modified to alter functionality or capability without the written permission of the Company; (i) to defects caused by normal wear and tear or otherwise due to the normal aging of the Product; (j) if any serial number has been removed or defaced from the Product; or (k) if the Company receives information from relevant public authorities that the Product has been stolen. Limitation of Liability. THE COMPANY DOES NOT ACCEPT ANY LIABILITY BEYOND THE REMEDIES SET FORTH HEREIN, INCLUDING BUT NOT LIMITED TO ANY LIABILITY FOR A PRODUCT NOT BEING AVAILABLE FOR USE, LOST PROFITS, LOSS OF BUSINESS OR FOR LOST OR CORRUPTED DATA OR SOFTWARE, OR THE PROVISION OF SERVICES AND SUPPORT. EXCEPT AS EXPRESSLY PROVIDED HEREIN, THE COMPANY WILL NOT BE LIABLE FOR ANY CONSEQUENTIAL, SPECIAL, INDIRECT OR PUNITIVE DAMAGES, EVEN IF ADVISED OF THE POSSIBILITY OF SUCH DAMAGES OR FOR ANY CLAIM BY ANY THIRD PARTY. THE CUSTOMER AGREES THAT FOR ANY LIABILITY RELATED TO THE PURCHASE OF A PRODUCT, THE COMPANY IS NOT LIABLE OR RESPONSIBLE FOR ANY AMOUNT OF DAMAGES ABOVE THE AMOUNT INVOICED FOR THE APPLICABLE PRODUCT. SOME JURISDICTIONS MAY NOT ENFORCE ALL OF THESE LIMITATIONS, AND ONLY THE LIMITATIONS THAT ARE LAWFULLY APPLIED TO THE CUSTOMER IN HIS/HER JURISDICTION WILL APPLY. What additional terms govern this Warranty? Additional terms may be provided on our website at vuze.camera, including in our terms of service, terms of sale and EULA. What laws govern this Warranty? To the extent permitted by applicable law, the terms of this Warranty shall be construed in accordance with and governed for all purposes by the substantive laws of the State of Israel without regard to conflicts of law provisions. How can You contact Us to request Support? 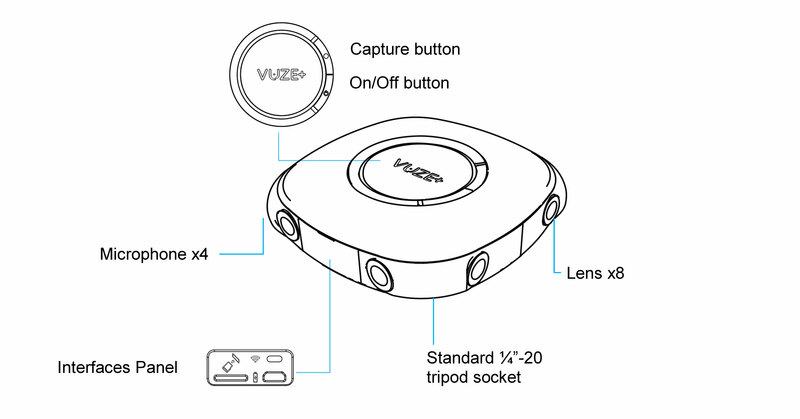 In addition to our online Customer Support form at vuze.camera/contact/, you may also contact Our Customer Support team at: support@vuze.camera. Any changes or modifications not expressly approved by the grantee of this device could void the user’s authority to operate the equipment. This device meets the government’s requirements for exposure to radio waves. This device is designed and manufactured not to exceed the emission limits for exposure to radio frequency (RF) energy set by the Federal Communications Commission of the U.S. Government. The exposure standard employs a unit of measurement known as the Specific Absorption Rate, or SAR. The SAR limit set by the FCC is 1.6 W/kg. Tests for SAR are conducted using standard operating positions accepted by the FCC with the EUT transmitting at the specified power level in different channels. The radiated output power of the Wireless Device is below the Industry Canada (IC) radio frequency exposure limits. The Wireless Device should be used in such a manner such that the potential for human contact during normal operation is minimized. This device has been evaluated for and shown compliant with the IC Specific Absorption Rate (“SAR”) limits when operated in portable exposure conditions. La puissance de sortie émise par l’appareil de sans fil est inférieure à la limite d’exposition aux fréquences radio d’Industry Canada (IC). Utilisez l’appareil de sans fil de façon à minimiser les contacts humains lors du fonctionnement normal.